Nassib (shoulder) is inactive for Sunday's Week 17 tilt against the Falcons, Scott Smith of the team's official site reports. Analysis: Nassib will thus close out his 2018 campaign in street clothes, but his play provided plenty of reason for optimism heading into the offseason. The third-year defensive end proved to be an effective pass rusher at times, logging a career-high six sacks across 15 games. With Nassib down Sunday, Vinny Curry and Noah Spence should see extended snaps as the opposite bookend to Jason Pierre-Paul on the defensive line. Nassib (shoulder) is officially listed as doubtful for Sunday's game against the Falcons, Greg Auman of The Athletic reports. Analysis: Nassib was a non-participant in practice all week and appears to be trending towards sitting out versus the Falcons. Vinny Curry will slot into the starting lineup if Nassib is unable to go. Nassib (shoulder) did not participate in the open portion of Thursday's practice, Eduardo A. Encina of the Tampa Bay Times reports. Analysis: Nassib sat out Wednesday's practice session, and he still appears to be nursing a shoulder injury sustained during Sunday's 27-20 loss to the Cowboys. If Nassib is unable to suit up Week 17, expect Vinny Curry to slot into the starting lineup versus the Falcons. Nassib had three tackles (three solo) and one sack in Sunday's loss to the Saints. Analysis: Nassib was unable to record a fantasy relevant stat last week but bounced back with a sack Sunday. The Penn State product now has 6.5 sacks on the season, and will face the Ravens in Week 15. Nassib had two solo tackles, a sack and a forced fumble in Sunday's win over the 49ers. Analysis: Nassib had only four tackles through the first five games of the season, but has now recorded a sack in five of his last six games. The 25-year-old played 73 percent of defensive snaps and now has 5.5 sacks on the season. Nassib (elbow) is active and starting at defensive end for Vinny Curry (ankle) in Sunday's Week 11 tilt against the Giants, Scott Smith of the team's official site reports. Analysis: Nassib's availability is especially valued on a week when Curry is unavailable. The third-year end has been coming on in recent weeks, already having compiled a career-high four sacks. He should have plenty of opportunities for more against a Giants team that's been among the most pass-happy in the NFL this season. 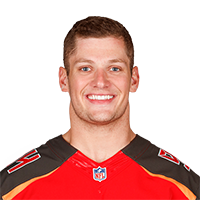 Nassib (elbow) was a limited participant in Thursday's practice, Carmen Vitali of the Buccaneers' official site reports. Analysis: Nassib had been absent altogether Wednesday, so his return to work in a limited capacity is certainly an encouraging sign. The third-year pro has been effective as a rotational end since joining the Buccaneers earlier in the season after being claimed off waivers from the Browns, totaling a career-high four sacks. Nassib has seen elevated snap counts recently in the wake of Vinny Curry's ankle injury, although it's worth noting the latter returned to practice Thursday as well in limited fashion. Nassib recorded a sack across his 43 defensive snaps during Sunday's 16-3 loss to the Redskins. Analysis: He's never offered much in the tackle department, but Nassib has now set a new career high in sacks (four) with seven games to go. The Penn State product has a decent chance of finding his fifth in Week 11 against a weak Giants offensive line. Nassib, starting in place of Vinny Curry (ankle), recorded two sacks and a pass defensed in the Week 7 overtime win over the Browns. Nassib will start at defensive end in place of Vinny Curry (ankle) in Sunday's Week 7 tilt against the Browns, Scott Smith of the team's official site reports. Analysis: Nassib will thus draw his first start in a Tampa uniform versus the team that made him a third-round pick in 2016. 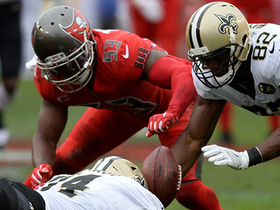 The 25-year-old has made minimal impact with the Bucs up to this point, totaling four tackles (two solo) and a pass defensed in five games. 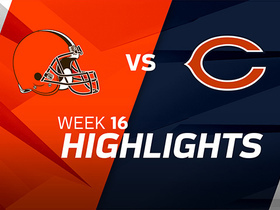 Nassib totaled two tackles (one solo) and 1.5 sacks in the Buccaneers' 48-10 loss to the Bears on Sunday. 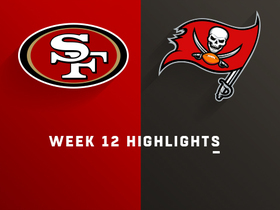 Analysis: The rotational defensive end played a total of 15 snaps in the blowout defeat, serving as the Bucs' most effective pass rusher in the process. Nassib figures to continue logging part-time snaps behind starters Jason Pierre-Paul and Vinny Curry, but with only 5.5 career sacks over his first two seasons, performances like Sunday's may be few and far between. 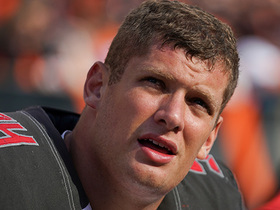 Nassib signed a contract with the Buccaneers on Monday, Adam Schefter of ESPN.com reports. 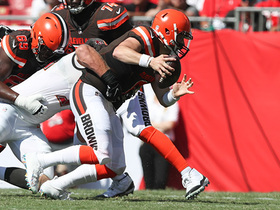 Analysis: Nassib became a fan-favorite with the Browns thanks to his appearances on Hard Knocks this preseason, but the team ultimately decided to let the third-year pro walk. He now heads to Tampa Bay where he'll compete for a depth role on the defensive line. Nassib was waived by the Browns on Sunday, Adam Schefter of ESPN reports. Analysis: Nassib was let go in order to clear a roster spot for a waiver claim. The Penn State product will become an unrestricted free agent if he passes through waivers unclaimed. Nassib is in line to start in place of Emmanuel Ogbah (foot) for the remainder of the season, Mary Kay Cabot of Cleveland.com reports. Analysis: With Ogbah on the shelf for the rest of the 2017 season with a broken foot, Nassib -- a second-year defensive end out of Penn St. -- will be inserted into the starting lineup. Ogbah was tied for the team lead with four sacks, while Nassib has accumulated two of his own off the bench. He'll try to add to that against the Bengals on Sunday. 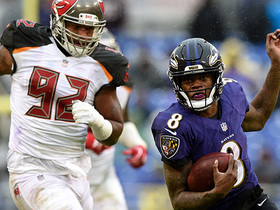 Tampa Bay Buccaneers defense struggle to contain Baltimore Ravens quarterback Lamar Jackson on this slick 11-yard run. 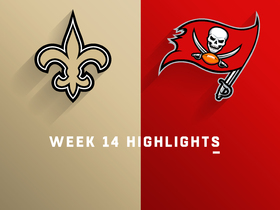 Watch both sacks from Tampa Buccaneers defensive end Carl Nassib against his former team. Tampa Bay Buccaneers defensive end Carl Nassib gets big sack vs. former team the Cleveland Browns. 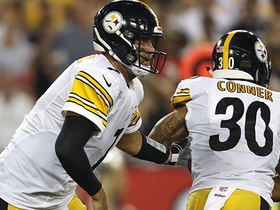 Miscommunication between Pittsburgh Steelers quarterback and running back Ben Roethlisberger and James Conner causes a 4-yard tackle for loss for Tampa Bay Bucaneers defensive end Carl Nassib. 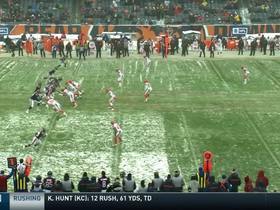 Cleveland Browns defensive end Carl Nassib is penalized for being offside on a pick-six opportunity.